She looks intently at you. With arms stretched, head tilted, her body reaches up to the sky. Her flounced dress follows the jerky moves of her arms and of her heels wildly stamping the ground. Without really glancing at her, the cantaor follows her dance with a quivering voice. He voices his lament and as he claps his hands (his palmas), casts a spell on her. By his side, a rain of notes comes out of the third fellow’s guitar. She ends her show sweating and panting. Her face relaxed, her anger atoned, she resumes a smile that she shares with her audience. They stand up and shower the dancer with applause as if to thank her for her genuineness. We are in one of the famous « cafés cantantes » in Seville; there are many to be found in this Andalusian area, the unquestioned birthplace of Flamenco. An artistic expression born from a mixture of singing (cante), dancing (baile) and musical accompaniment (toque), Flamenco is by itself a summary of the immaterial cultural possessions acknowledged by Unesco on November the 16th 2010. However, the true origin of Flamenco is still hard to define. One has to refer to literary works to find out testimonies, the first of which appear in the XVII th century. 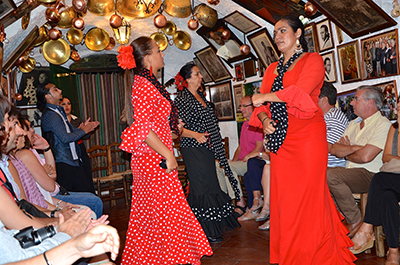 In Gitanilla, Cervantes tells the story of Preciosa and of her Andalusian dances. In 1740, in the manuscript of « Bachillos Revoltoso », there appears the grand daughter of Baltasar Montes, the oldest gipsy in Triana. She dances for the Seville gentry to the tune of instruments. Undoubtedly, Flamenco was born in Andalucía, at the crossroads between Northern Gipsies and Southern Gipsies). Christian, Arabic, Jewish influences are many but the heart of this art beats first and foremost to the Gipsies rhythm. After leaving India, this nomadic people arrived in Andalucía in 1440, from everywhere. They then gave birth to an art which was only based on singing, mixing together the various artistic, religious and cultural influences they had come across on their way. 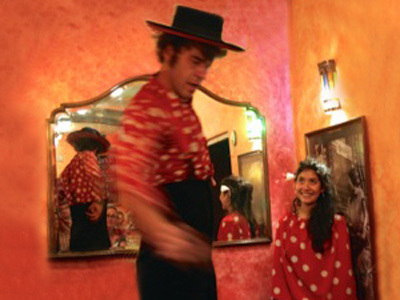 It was in what is called « The Golden Triangle » made up of Seville, Cadix and Huelva, that flamenco drew its inspiration. In 1499, the first laws against Gypsies appeared and nomadism was outlawed. Besides in the XVII th and XVIII th centuries, their language was forbidden. Persecuted until the year 1783 by the crown of Spain and converted to Catholicism, they expressed themselves through singing in private parties. Andalusian gipsy music then became a tradition kept secret and handed over only from one generation to another. Like a sentimental barometer oscillating between sorrows and joys, the gypsy soul shows through flamenco. The first form of expression was a cappella swigging « Palo seco », a name given early Flamenco, the best known genre being the tona. Although dancing and instruments only came later on, these three elements put together give today’s flamenco all the voluptuousness, drama, joy and sadness we know. Singing or « cante » is the very gist of Flamenco. Sixty types or so of songs have been listed. Some songs refer to a town like Granadina (for Granada), Rondena (for Ronda); other songs refer to a social status such as Carcelas (for prisoners), Mirabras (for vegetable sellers on markets) or still Cante de las Minas (for miners), or a time in the year like Saetas (for the Holy Week). These various types of songs can fall into two major categories according to the nature of the emotion that is conveyed. The most tragic among them, « cante jondo » is according to Manuel de Falla « an extremely rare example of primitive singing, the oldest in the whole of Europe. It is endowed with the nakedness, the quivering sensitivity of Eastern races ». As for « cantes festeros », they convey happiness, like Alegrias or Rumba. 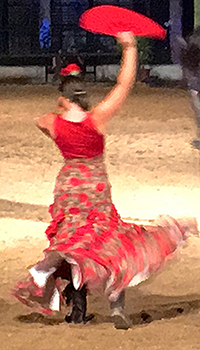 Dancing or « baile » has brought Flamenco another dimension, giving birth to new emotions -from the most superficial to the deepest- stressed by the power of « taconeos » (heel clicking), definitely rooting the woman’s body in the depths of the earth. Flamenco is an emotional, disturbing art ranging from laughter to tears. Dancing through her sensual, sensitive, harsh and delicate moves does bring out an ambiguous feeling. Musical accompaniment or “toque” is chiefly represented by the six stringed Spanish guitar. As years went by, castanets, “palmas”, “cajon” were added. In the history of great guitar players there come to mind such names as Manolo de Huelva Nino ricardo, Ramon Montoya or Paco de Lucia. With time, Andalusian gipsy music has never stopped changing. According to Paco de Lucia “Flamenco has too much personality, strong nature and emotional strength of its own to be able to be the same always”. It will also become popular – to some people’s despair – bearing the name of Andalusian folklore with the appearance of differences, like Sevillana, Fandango, Vito. “Cafes cantates” multiply to enable enthusiastic artists to express themselves freely. Flamenco didn’t wait for recognition by Unesco to spread all over the world. From Latin America to Asia, lots of academies have been opened. Formerly considered vulgar, it has become today a valued art, a rough diamond which purists try hard as best the can to keep from blemish.